Women want home births so they can drink whiskey! Early in my days of blogging, I participated in Yahoo Answers. Somewhere I read it was an easy place to drop a few links, but the idiotic questions and answers were too much to sustain any sort of relationship. 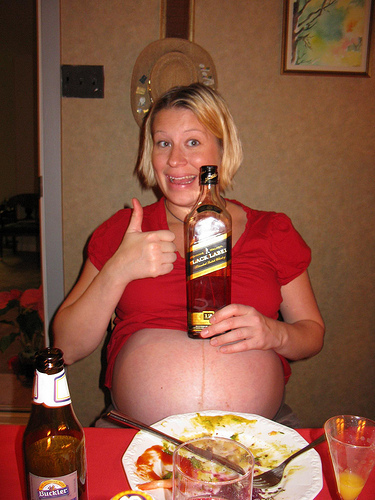 Is the real reason women have a home birth so they can drink whiskey while in labour? The question made me laugh out loud. Yea, that’s right. After nine months of no alcohol, I wanted to be drunk on whiskey in labor. Sorry home birthers, our secret is out. Of course this question can be viewed two ways, either seriously or as a joke. As you can tell by the answers, it was viewed both ways. No. when they are at home, it is a more comfortable environment, they are not given rules on how many people can attend their birth…they can have their baby any way they want, (In a tub, on the bed, lying down, sitting, etc)..and they can walk around, eat when they want, and do things to help calm themselves that a hospital would not allow. When you’re in a hospital, you’re hooked up to machines and basically on bed rest until the baby arrives. It isn’t even good physically, for the mother, to be giving birth like that anyway just because of the position. And some doctors are assholes and only want the mother to give birth according to their schedule..SO..when you give birth at home, there is less stress and the baby arrives when he/she wants to arrive. Not because some doctor wants a lunch break. Watch “[amazon_link id=”B0013LL2XY” target=”_blank” ]The Business of being born[/amazon_link]”. You will get a new perspective on our medical system and home/birth center births. Our society keeps women afraid of what our bodies are naturally meant to do and insist we need meds to put us into contractions which then causes more pain that then leads to needing more interventions that are unnecessary. We research buying cars and electronics more than we do our own births. And now for some comedy! The birth of our third kid was at home. I kept hearing my wife squawking something about the hospital, but the game was on and The Bears were playing, so I just tuned her out. When the game was over, there she was in the back of the trailer with a new kid.Don’t think I’m an insensitive guy, though; I went out and got her some pork rinds and a Mountain Dew. Somehow my midwives forgot to put whiskey on our list of home birth supplies. Well I don’t think that first bit of “comedy” is very funny, specifically the classist nastiness. However A. as far as darkness on Yahoo answers, that’s pretty tame and B. I did laugh when I got to the “pork rinds” mention because my second birth was a homebirth and it was so easy I have made the joke that I looked up now and then and my partner was just hanging out eating pork rinds (instead of wearing himself out like he’d done at the previous, hospital, birth). He wasn’t actually doing this but I think it gets across how much more relaxed the whole thing was.